The RAPCO line of FAA approved dry air pumps offers quality and performance at a great price. They are available new or overhauled. New models are FAA-PMA approved as a direct replacement part. Overhauled pumps are produced under our FAA process specification and come with an FAA form 8130-3. Since 1982 RAPCO has produced over a quarter of a million dry air pumps, adding many product improvements along the way. All new pumps have an inspection port for monitoring vane wear which increases safety by helping to determine when replacement is needed. All new RAPCO dry air pumps have an oil seal on the main shaft to help prevent oil from entering and damaging the pump. New pumps also come with cooling fins that reduce operating temperatures and helps to extend pump life. In addition, there is no core charge when purchasing a new RAPCO dry air pump. 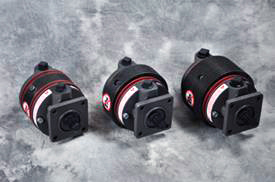 All RAPCO dry air pumps, new or overhauled, are internally coated with a special Mil-Spec. hard lube coating that reduces friction and wear. Our carbon rotor has also been improved by chamfering the leading edges of the vane slots. This helps to reduce the chance of failure due to foreign object damage. For convenience, RAPCO includes a mounting gasket and vane measuring caliper in the box with every pump. Dry air pumps can be used for vacuum or pressure system applications. RAPCO quality dry air pumps offer exceptional value and are backed by our warranty. RAP215CC series, RAP216CW 3 years, 1300 hours from date of installation or 4 years from date of manufacture whichever comes first. RAP241CC series, RAP242CW series 1 year, 500 hours from date of installation or 4 years from date of manufacture whichever comes first. RAP441CC series, RAP442CW series 1 year, 500 hours from date of installation or 4 years from date of manufacture whichever comes first. 211CC series, 212CW, 215CC, 216CW 2 years, 1000 hours from date of installation or 4 years from date of overhaul whichever comes first. 241CC series, 242CW series 1 year, 400 hours from date of installation or 4 years from date of overhaul whichever comes first. 441CC series, 442CW series 1 year, 400 hours from date of installation or 4 years from date of overhaul whichever comes first.